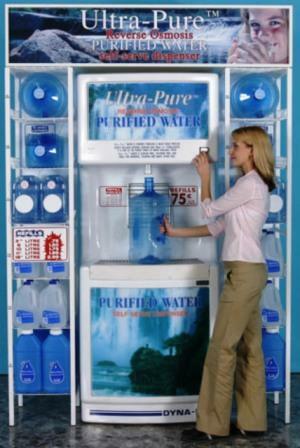 Ultra-Pure Reverse Osmosis water purification systems incorporate state of the art, fully automatic, multi-stage processing that works quietly and reliably in the background to provide your establishment with purified water at an amazingly low cost, virtually unparalleled in the industry. Available in a wide model range and configured to suit any retail or merchandising requirement. Equipped with Sump Pump: Removes all spillage from the filling area. Automatic "sold-out" lights up and shuts down dispensing when out of water, and Automatically re-sets machine after 15 minutes of making more water. The Slim Line profile is the most stylish available today! Makes best possible use of available floor space! Sanitary, high density gel coat, high luster, fiberglass finish. Eye-catching marquee with quality graphics provides the highest level of visibility. Illuminated push button on dispenser is easy for customers to locate. Roll-out design for easy cleaning under cabinet! Safety over-flow shut-down / high/low pressure shut-down on water supply that resets itself when water supply problem rectifies. Built in sensors and controls for monitoring of TDS readings, UV sterilization strength, and low voltage. Controls provide a warning as conditions approach maximum allowable tolerances, and shut down the system if maximum tolerances are reached. Unit will allow restarting when the condition is rectified. 378 liter (100 gallon) storage capacity with re-circulating ozone, which was developed by Dyna-Pro Environmental in conjunction with the University of Manitoba, and is found exclusively on Ultra-Pure systems. The U of M concluded that re-circulating ozone is a reliable form of natural sanitation. Produces the purest and most delectable water available. Multiple Dispensing Heads speed up dispensing and reduce customer line-ups at extra busy locations.